First, get a random article from Wikipedia (left side of page under "Navigation"). Title of article is your band name. Next, the last part of the last quotation at the bottom of this page is the title of your album. Finally, the third photo* on Flickr is the cover art. 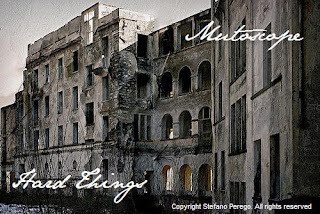 Introducing "Hard Things," the debut CD from Mutoscope. Note: Many photos on Flickr are copyrighted. This one belongs to Stefano Perego. I had to look up what mutoscope meant: The Mutoscope was an early motion picture device.